Pokie machines are found throughout New Zealand, but what Kiwis have been really crazy for lately is playing pokies online. Playing pokies from your computer, smartphone, or tablet offers all the fun of playing in a land casino with even more options and ways to win. But with so many titles and online casinos out there, it can be hard for New Zealanders to decide which ones to play on first. At CardsChat, our online pokies New Zealand team is dedicated to finding the best online slots and casinos so you can start spinning and winning real money, quickly. 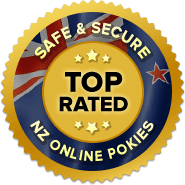 For April 2019, our top rated New Zealand online pokies site is SlotoMania. Read more below to learn what makes a great online pokies site great and what we look for in every pokies site we review. The most common types of pokies you’ll find are three-reel, five-reel, and video slots. Three-reelers are considered the "classic" style and are easier to understand for new players as they have less features. Five-reel pokies increase the number of winning combinations by the power of two and are typically more volatile with larger payout varieties. Video pokies, the latest in slot technology, are what you’ll find online the most. These offer more payout and win combinations than the basic reeled-machines. Famed for giving the largest payout in online slots machine history, Microgaming’s Mega Moolah is played by millions seeking a jackpot near the 28,757,400 (in New Zealand Dollar) awarded to a lucky player in 2015. Named for its feature that "links" at least two of its five reels together, Twin Spin from NetEnt’s unique features have made it one of the most enjoyable and popular pokies in recent memory. A pokie that will not only make you rich in real money, but also in laughs. Playtech’s Spamalot slot is more than true to its source material and has such a long list of bonus features that it would be impossible to list them all here. One of the first online gaming software developers in the world, Microgaming is still regarded by many as the best more than 20 years later. Based in the Isle of Man, the company’s most famous pokies games include Mega Moolah, Avalon II, and Thunderstruck II. NetEnt handles over 21 million online gaming transactions a year and is considered one of the most reputable companies in the business today. If you sign up for an a casino online that has NetEnt pokies, definitely give popular games like Starburst, Twin Spin, and Gonzo’s Quest a try. Sydney-based Aristocrat Gaming is the largest maker of pokies in Australia, and also one of the largest in the world. Many, if not most, of their pokies titles are digital versions of their popular land machines and include many with licenses from popular TV shows like Game of Thrones, The Walking Dead, and Sons of Anarchy. Many online casinos have deals with certain developers, so before signing up for a site, make sure they have pokies from a developer you enjoy. For April 2019, our top rated New Zealand online pokies site is SlotoMania. We consider many things when we review online pokies. New Zealand players will be pleased to know that every pokies site we recommend are evaluated many categories before we put our name and endorsement behind them. The most important thing we look at is an online pokies site's security. Any site we recommend is going to be certified and independently audited by an organization like eCOGRA or Technical Systems Testing, both which ensure that online casinos meet stringent standards for fair play and transaction security. Banking and other personal information is protected at most top online casinos by 128-bit SSL encryption, which is the same security that banks use to keep their clients' financials safe. Once we know a site is going to protect our money and information, we make sure there is a decent amount of options for NZ players to make deposits and withdrawals using NZD and other currencies. Mainly, we look to see that they accept the most popular types of credit cards and e-wallets, as well as some sort of bank transfer. Next we look at games' software and graphics. This doesn't necessarily always mean that pokies with the flashiest and most state-of-the-art graphics always get the best reviews, though. Instead, many of our top-rated online pokies have simple graphics with smooth software that ensures a lag-free gaming experience. Graphics and special effects should only enhance your pokies experience, not distract from it. But the best online pokies should all be more than just a pretty face. That's why we look for pokies sites and individual slots that offer a slew of strong bonuses. These include sign-up bonuses that come with your first few deposits and the bonus features within the online pokies themselves. Finally, in the rare event you would have some sort of issue with an online pokies site, we make sure there is quality customer support to help you fix the problem. Our top-rated sites all offer speedy service via email, phone, and/or live chat. The latest craze in online gaming is mobile play. Whether you are waiting in line or are on a long commute, there's no better way to kill the time than by playing online pokies for real money on your smartphone or tablet. Most online casinos worth playing on (and nearly all the ones we recommend) have fantastic mobile casinos that can be played in your device's browser or through a dedicated app. A large number of apps are available for iOS and Android devices like the Apple iPhone, iPad, and Samsung Galaxy, however there are also great casino online apps out there for Blackberry and Windows Phone devices. These HTML5-friendly sites and mobile apps are often simpler and easier to navigate than their normal computer-counterparts. The pokies and games themselves are optimized for smaller screens and strip away anything that isn't essential to offering a great gameplay experience. This means that the game experience is going to look great on the screens of most iPhone, iPad, Android, Windows Phone, Samsung, Fire, and other smartphones and tablets. 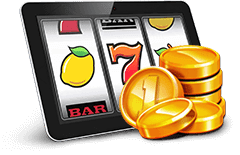 Beyond just simpler interfaces and being able to play from anywhere you want, there are many other great reasons to play mobile pokies. Due to the popularity surge of mobile online casino gaming, many sites offer bonuses available to those that sign up and begin playing on a mobile device. No matter if you are an Apple, Samsung, Blackberry, Windows, smartphone, or tablet person, there are fantastic mobile pokies options out there for all, with even more to come as online pokies' popularity grows every year. 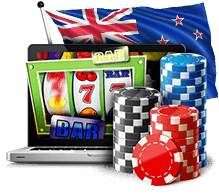 We've ensured that New Zealand players have access to the best overall sites for online pokies, providing a good selection of games on secure, independently audited sites that play well on any device, accept top payment methods, and offer excellent player support. Start playing today and find out what millions of Kiwis already have: that online pokies are a great way to have fun and win real money at the same time from the comfort of your own computer or mobile device. Unlike going to a casino and paying for parking and expensive food, you can begin playing online for not much more than a few New Zealand Dollar. Special feature that multiplies your win by a given amount when triggered. Straight or zig-zagged line that crosses all of a pokie’s reels. Two or more identical symbols on a line in a row results in a payout on most paylines. List of possible payout amounts for each winning combination and bet size in a pokie (also known as a payout table). Jackpot that increases steadily over time with each game played. These are often tied to multiple pokies, often resulting in jackpots that grow very large. Algorithm that generates at random the results of a pokie spin from all the possible outcomes. In New Zealand, the pokies you find in pubs and hotels are run by charities. NZ laws prohibit individuals from opening up their own casinos or installing pokies wherever they see fit. Fortunately, the online world is governed by a completely different set of rules. Prospective players in New Zealand can freely access international sites to enjoy as many online pokies as they wish. The top overseas internet casinos are fully licensed to offer global play. What different pokies are available? The best casinos online offer several hundred different pokies but most are variations of the same thing. Online pokies can be sorted into one of two camps, traditional and video. Traditional games are celebrated for their simplicity. Beginners will quickly notice that these classic pokies have 3-reels. Video pokies are much slicker, typically have 5-reels, and feature console quality graphics. While video slots let you bet on more pay lines, the overall odds aren't necessarily better than traditional pokies. The most popular pokies are the licensed games that feature your favourite superheroes, movie characters, and television shows like Game Of Thrones. Of course the games you choose are ultimately a matter of personal preference. Online pokies that share a prize pool across a network tend to feature the biggest jackpots. Just look for prominent banners showcasing million dollar jackpots. You can also head straight to progressive jackpot games. Progressive jackpots grow with every spin until someone wins. That means that every loss funds a ballooning jackpot that you can hit at any time. With jackpots often measuring in the millions, the bigger ones have the potential to change your life. Are there any games that pay out more often? Just like their live casino counterparts, online poker machine payouts vary widely. You'll not only find different rates depending on the game you choose, but the same game may offer better or worse payouts on a competing site. Most sites will tell you the overall odds on each game. Are pokies safe to play? Online pokies are absolutely safe provided you play at a reputable gambling site on your mobile phone or home pc. All the leading sites safeguard your payment information, personal data, and gaming history on the site. It's more discrete than playing at a pub or live casino where surveillance cameras record every spin. Are online casinos and pokies rigged? Online pokies at the top sites are fair. The outcome of each spin is the result of a random number generator. These computer programs are identical to what you'll find at a live casino. When you play at a licensed and regulated online casino, the random number generator and its results are independently audited. When playing online pokies, it's always best to choose games with the best payouts. The percentages are usually displayed alongside the instructions of each game.